Sewing was my way to afford more clothes; when I was in high school it was much cheaper to make your own clothes, than to buy ready-made. Times change, and tastes too; I no longer wear the same type of clothing, preferring my Carhartts to mini skirts and sweatshirts to tight cotton blouses. During the Bicentennial you couldn’t swing a dead cat without seeing a quilt contest, so I started patchwork and quilting, leaving behind all those frustrating garment-making sessions. Patchwork was my sewing salvation. I could still sew for hours on end and it was actually enjoyable. No more pesky sleeves to set in and collars to turn to perfection! Pure bliss. I could sew for miles making a quilt top, and it felt the same way I would imagine setting out on the freeway feels when you’re wanting to escape. The delayed gratification that goes hand in hand with quilting did not put me off, as I was used to waiting patiently for a calf to become a steak or a seed to become a pie. The other day, when he complained that the zipper on his work vest was about kaput, I stepped up to the throat plate, and offered to fix it, hoping to move up a peg on the score board. He was dubious; what seemed simple to me, looked difficult to him. No fear, I said, waving my Woman Craft wand, I can fix it right away. Secretly though, I was itching to use a 40% of coupon at Joann’s or just have a reason to peruse their fabric aisles. As luck would have it, Joann’s didn’t have the right kind of zipper. Dang, I would just have to make a stop at Fabric Depot which just happened to be on my way to Bob’s Red Mill. Not. But what can I say? I had to go to Fabric Depot, the selection is much better…muahahahahaha. No coupon, but I did find my zipper and I got to dream over several lines of fabric, sigh. If I didn’t already have enough fabric to make every quilt on my quilt bucket list x 3… Alexander Henry I love you! But, I am digressing here. The failure in the zipper was the pin, somehow with all that continuous Man Craft business it got tore off. I’m of the mindset – don’t ask, don’t tell. It doesn’t matter how it got tore off, it is still off and not working. He works down in the Gorge where the wind blows mightily; it can be comfortable here at home out of the wind, and he has to go spend the day in the wind tunnel. So the vest really needed fixing. All I needed to complete the job was a new zipper the same length as the original, and common sewing kit fare of: thread, seam ripper, and scissors. 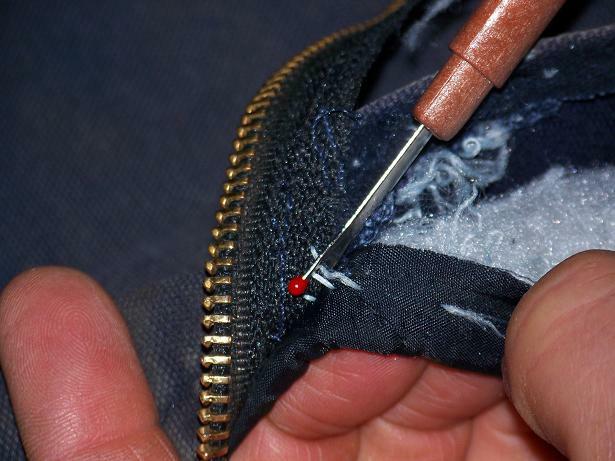 The first order of business in this type of repair is to remove the old zipper. A seam ripper is the easiest way to do this without damaging the fabric. I had to release the top stitching and the seam that held the zipper. Once you get the garment opened up, it is easy to see the stitches, and all you have to do is remove the stitches until the zipper is entirely free. (I didn’t get pictures of the entire process.) 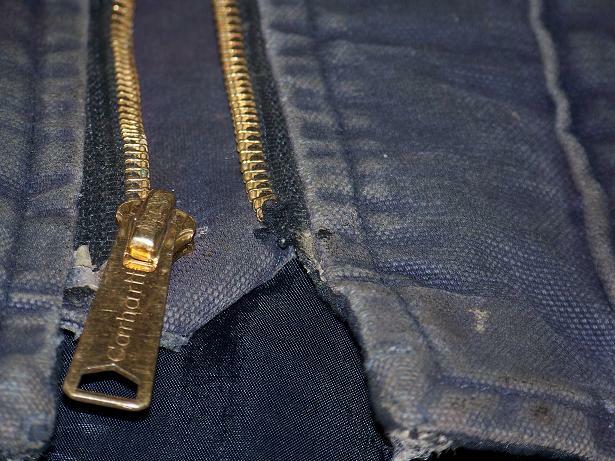 After the zipper is freed on both sides, insert the new zipper one half at a time and pin to secure. Sew, matching the stitch length of the top stitching. Repeat with the remaining half. Due to the heavy use this vest gets, I double stitched each half. Hopefully, this $4.00 zipper will keep this vest going for some time. I could never get the zipper to match up properly until I tried a trick a friend told me about, and I was wondering if this is how you do it too. I’ll sew in the first half of the zipper, aligning everything as carefully as possible (oh, and I use a zipper foot). Then I zip the second half of the zipper to the half that’s already sewn in, and sew down the second half. Volia – perfect match! It can be a little clunky to stuff the whole mass through the machine, but mine is quite forgiving and at least I get the zipper lined up properly. Keeping the zipper zipped while sewing would have been too bulky and annoying for me, but zipping it together, then pinning in the correct place worked well. I just unzipped it and did the sewing. I wish the camera had been available for the whole project, pictures help a lot if you’re new to sewing. Also by not opening up more of the vest than needed, it was pretty fool proof to line up the halves. Boy, if I ever used the terms “Woman Craft” or “Man Craft” I’d find myself sleeping in the barn with the cow. Not that we don’t have different skills. We do, and we acknowledge and celebrate our complimentary differences. BUT, gender labels are taboo. Thanks for the tutorial. One sewing question… our sewing machine can’t handle multiple layers of heavy fabric any more (I don’t know that it ever could, but it has been an issue lately.) We are thinking of getting a new(ish) one. Simple but tough so we can use it on jeans, weaving and felting projects, etc. Any recomendations? Speaking of ManCraft, I had to borrow a friend’s machine to do this job, since my machine had an “unfortunate” accident due to someone’s driving skills…resulting in a chipped flywheel gear on my machine. Definitely a post itself, that story. I absolutely love my Singer 301 it is from the 50’s and very strong and is(was) capable of sewing through multiple layers of fabric and heavy duty materials. My friend’s machine is a Bernina 1008 and she loves it. It breezed through this zipper project like it was butter, and I re-stitched the pockets too where they were starting to come loose, and that was even thicker, since the pockets were applied before the lining at the factory. I’m a lurker, but just had to comment on this. My sewing machine wouldn’t make it through the two layers of flannel and one of batting for my quilt until I bought a walking foot. It’s awesome! I’ve got my machine in for service since it stopped zig-zagging, but once I get it back, I’ll be a carhartt patching fool! I would totally agree with Matron about getting your machine serviced. It will cost me about $75 to have my machine overhauled. Much better than the $300+ for a decent new machine. Fabric Depot is the devil. I can’t get out of there in less than an hour. There’s so much fun stuff! Warps my mind into thinking I have plenty of spare time, so why don’t I buy some of that really great fabric, and this really fabulous print, and oooh, that one too! The devil! Rae, gahhh I know what you mean, I try to stay out of there! When they were Fabricland, the store closest to me was by the their warehouse, Fabric Wholesalers and geez you should have seen the bins of scraps! Sold by the pound of course. Yikes!!! I think the only thing worse for me would be living near the Homer Laughlin warehouse, thinking of all that Fiesaware makes me giddy. I dream in Fiesta!! Rae, yeah I’m kinda in “sort of” phase too – and dreaming of a ruby burple bowl to match my green ones instead of Fiesta. If only I had won one at the one of those many dime toss episodes at the fair when I was a kid, now they’re expensive. I also sewed most of my clothes as a teen. I had a lovely time picking fabrics and custom fitting. I sewed on a Singer treadle back then. Now it’s a 1914 New Home cabinet treadle. This machine is much less forgiving than the old Singer was. I sewed jeans on the Singer, but the New Home won’t handle that heavy material. I’ve collected most of the Herriot books, except for 3 of the original British editions. I recently read the biography written by his son. My very favorite book is The Best of James Herriot. It has color photos and sidebars with recipes and other info. Pam, you know I really did like sewing my clothes, and I didn’t realize how frustrated I was until I started patchwork. And by then I was working for the Forest Service so it was good to leave dresses behind. I love James Herriot, so easy to read and easy to relate to, he is spot on about the people and the animals! I’ve started doing more hand-basting, especially for bulky projects. Takes a little more time, but makes it easier to run through the sewing machine w/o distortion and w/o having to stop and remove pins as I go. Plus I don’t get stabbed by pins when trying to manuever the bulk through the machine. 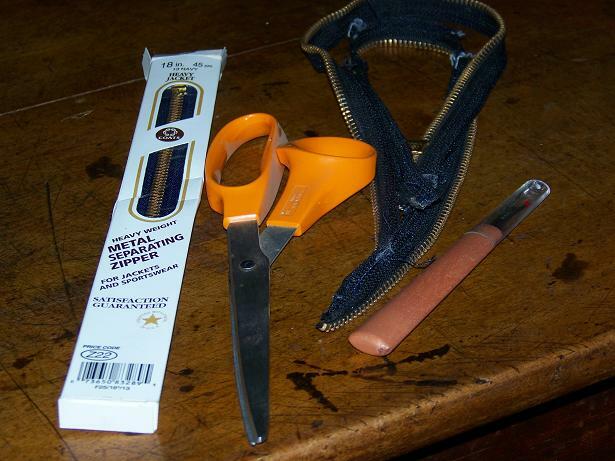 I’ve always had a time with zippers – but I’ve picked up some good tips here. AND I happen to have a vest with a broken zipper that’s been jeering at me from the sewing basket. I do both the man and woman crafts here and, while it does give you a nice balanced set of skills, my man craft skills are way worse than my woman craft skills. I am thinking about taking up some patchwork this summer – when I put my knitting needles down during the warmer weather. Susan, I hear you – I’d rather be cooking than running around on the roof or gardening instead of cleaning out the feeding shed. Works for us! I have Every Living Thing right here at my desk at work! We are sympatico! Jennifer, it so good, I was reading it the other night while stirring gravy! I was getting hot standing over the stove and I was reading the chapter about the newly altered suit and how warm he was during his testimony for the dairyman. Perfect timing! Oh boy, another one of those posts I can SO relate to! I made some of my husband’s clothes also, including a suit, jeans and shirts. Then I moved on to baby and toddler clothes… and then I discovered garage sales and thrift stores. Then the fun became the ‘chase’ to find that great piece of clothing at the lowest price. I moved on to sewing other things, crafty things, including stuffed freestanding roosters. Then that changed to sewing simpler things to sell at craft sales and farmers markets (aprons, cloth shopping bags, etc). Eventually the clothing that needed repairing hung a long time in the sewing room…. it was more fun going to a half price sale at the thrift store to see if I could replace it. I didn’t want to put a lot of effort into repairing something that was well worn, and came from the thrift store in the first place. I’ve been slowly picking away at getting my sewing room cleaned up. It is well insulated though, a couple of walls are covered with shelves filled with fabric:( It’s much easier to buy it than it is to sew it, and I can’t pass up a bargain. So those mill ends, deals by the pound, etc, I just can’t pass them up. I think I have a greatly inflated idea of how much I can actually get sewn into something. I did make one quilt in my early 20’s, I think it was totally hand sewn, but it was only small. And is there something about men and zippers? I’ve repaired far more zippers on my husband’s jackets and vests than I ever have on my own. And mine get just as much use as his. A note to Alan…. the right needle for the job makes a huge difference when sewing awkward things. Yes, definitely the needle does make a difference on all projects – hand or machine – for this project I used a denim needle, even though the material is duck. I like snaps myself instead of buttons and zippers. They seem to hold up better if you get quality snaps like from BeeLee. I started making hubby’s workshirts with snaps, we both liked the results much better! I think all my fabric is adding to the insulation too! I just finished a similar project for my HHWB (hired hand with benefits – took that from someone’s blog:) I call him “zipper challenged” which does not set well. He had FIVE winter-type jackets with non-functioning zippers – now only four and one that is fixed! I have a newish machine that is great – used a heavy duty needle. I’m so impressed that Hangdog can mend on his own! I’m saving this one, one of my zippers is about done for, love the jacket. Okay, that tears it; I’m gonna hafta go check out Fabric Depot. While I’m at it, I wanna go pop into The Mill End Store. Have you ever been to that one? It’s on 99. The Pendleton mill store on 99 has also been beckoning to me for awhile…. Paula, What! You haven’t been to Fabric Depot! Me and and Mill End store go way back, but I really liked them better when they were in the old mill, and had the huge Annex with mark downs…it was a good place to get lost. I just got back from Fabric Depot, I picked up two zippers, because the ready-made length on that vest was different, so I returned the one I would never use, and bought some quilting thread instead. Never can have enough of that! The Mill End Store is on my route from Bob’s Red Mill to Concentrate’s, funny how I just seem to find these “perfect” routes 😉 I think my Silverado is like the one in the new Chevy commercial where the truck comes back to the house like Lassie to alert the parents about Tommy. Only my truck comes home to say I am lost in the fabric store! My oldest is officially in 4-H this year and is taking sewing and gardening…I am hoping to learn along with her, unfortunately, I wasn’t paying attention when my mother tried to teach me. I do remember staying up late the night before the fair trying to get a hem right and last minute recordbook marathons, I hope I don’t repeat that… I am also enjoying reading about what everyone else has on their nightstand. I have added about 14 items onto my Amazon wishlist! Don’t you know it, geez all those books sound so good. I picked up another hold at the library today (Tipping Point, Gladwell) so I guess reading is on my list! ugh. My mom sewed all of my clothes as a kid, and the “important stuff” (prom dress etc.) when I got older. My sister followed and did a good job on her stuff. I HATED it. Once did a difficult fitted jacket and trousers and got it perfect (high school) – I think that it was so difficult I just knew I couldn’t understand all of the pieces- so worked slowly and carefully enough that I succeeded. And it was the LAST thing I ever sewed. Can’t bear mending, though recently I gave myself a good talking to about that attitude, LOL. Need to be financially more conservative, and a little mending fits that goal. Learned much later in life that I have a very poor ability to visualize things – and moving from flat to 3-D is just nearly impossible. Which fits what I remember of doing the pant suit – I followed directions to the tiniest detail – it was so complicated that I didn’t try to understand it, I just did it. My mom tried to teach me “the right way” – wanted me to imagine and understand it, because she knew the directions weren’t always right. Hayden, yeah I think you hit the nail on the head, if you can’t visualize it, it does not come easy. I had several frustrated adult quilting students that were excellent seamstresses but could not “see” the break down of the quilt patterns. And unfortunately in CC you only get so many weeks, and then you start over. Some stuck with it and some just gave up in despair. Gosh you missed out sewing your formals – that was the fun part! All that fancy fabric, lovely but difficult. My one sister hated sewing and the other one is practically a tailor, I fell in between with my quilting. Hope it helped, sewing just takes a little patience and having the right tools makes a huge difference. Dear Matron I love quilting hate patching clothes I can get clothes cheap at the thrift store with no stress. My husband sews better then I so I am lucky. My daughters learned how to fix their own, guess they figured that one out when it was in the repair basket for a year. I am reading Arctic Experiences by Captain George E. Tyson. it seems to fit with the weather and history fascinates me. Buttons, repair basket what’s that?? Just kidding, I would rather be quilting too! Very cute post. I think in much the same way you do. I’ve been sewing since I was 4, so going on almost 20 years of sewing, and when a friend of mine tears her buttons, or needs something hemmed, last minute, it’s the end of the world, I stop in for just 20-30 minutes and all fixed. I’m amazed by how few people my age know how to mend a zipper, etc. Great post. Now, however, zipper fixes were ones that I avoid like the plague, until I started using a water soluble glue to hold the zipper in place while I sewed it down. Most people I know would’ve thrown out a perfectly good pair of pants/skirt because the zipper tore out, but as you put it, a $4.00 zipper will keep the item going much longer. Also, I work in a quilt shop, I made a rule that I could not buy anymore fabric until I finished the current projects that I’m working on. That is the toughest rule to follow when I get to touch and play with fabric all day long. That is an excellent tip about the water-soluble glue. I use Roxanne’s or just plain old Elmer’s Glue. If I use Elmer’s Glue I make sure to iron it down (setting really doesn’t matter, I usually have it set on Linen so I get a quick high heat for anything I work with), that way it will hold quickly. Just got to make sure not to start sewing right away since the metal on the zipper (or even the plastic) will be too hot…I’ve got a few burned fingers from that. Sometimes I’m working too fast, I just want to be done with zippers so I can just sew the quilt tops! Oh and yes, temptation abounds at the shop. The shop has over 1000 yards of Batiks alone. Just the other day I had to purchase 3 yards of fabric…for a new project, oh, I guess I just broke my own rule! Oh well. Also I agree, I’m not a fat quarter person either, I like 1 yard to 3 yard minimum cuts. Thanks for the glue recommendations, that sounds perfect! OH that was too funny! I’m going to bring that up at my next guild meeting. You could say that Quilt Guilds could be the association of members that “can’t cut it anymore!” but at the same time, tempt one another to just keep on building up those stashes, yet at the same time, to make quilts. I just did my first zipper replacement for the same reason! I found an ankle-length down-filled coat at a thrift store for $15 and the only problem was the pin at the bottom of the zipper. I thought “I can fix that!” (having never actually put in a coat zipper before…) and I did. 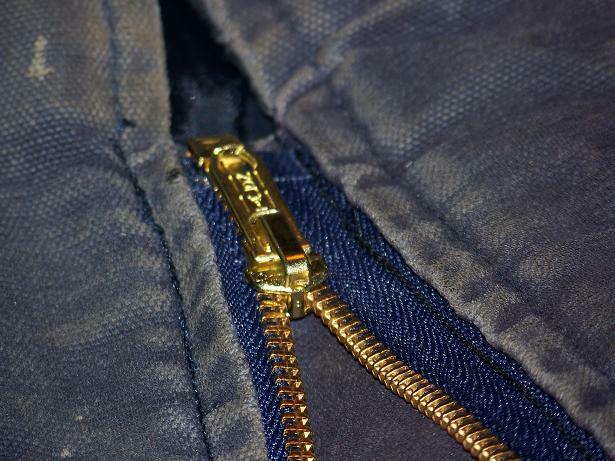 I found an online zipper retailer (since I wanted a long brown two-way separating zipper, unfindable in stores)… it was a bit of a challenge, but I just followed the same steps I took while undoing, and did pretty well, if I say so myself. And as for Woman Craft and Man Craft… lol my husband will love these terms. We are always battling in our own ways about this. We agree that men and women are different, and that there are certain things he does better, and I do better. Where I get irate is at the idea that it’s because I’m a woman that I’m genetically predisposed to doing laundry. I keep telling him that he just hasn’t had enough practice, but then my desire to not have my clothes ruined prevails, and I do the laundry. If only he wouldn’t insist on trying to tell me *how* to do my “Woman Craft”. I don’t tell him how to clear the snow or empty the garbage, but he keeps sticking his nose into the cooking, dishes, laundry etc…. *sigh*. love the James Herriot series. I am amazed by the zipper man! My friend drives down from Hood River, so we can go to the Mill End store together. Didn’t spend too much this time, but I’m thinking about another trip. I do like their prices. I was driving between Vancouver and Hood River during those high winds. No fun for sure. 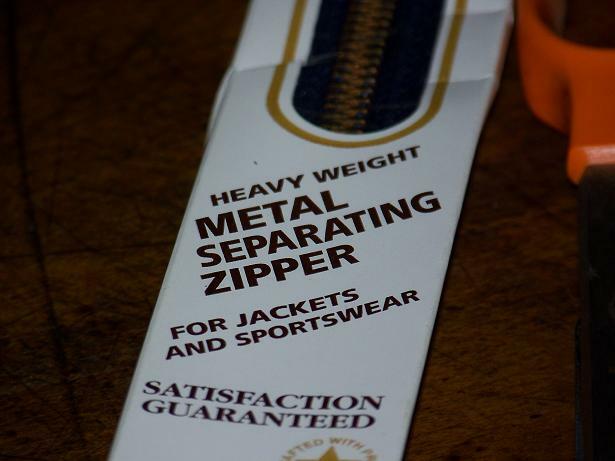 If you have anymore trouble w/ your zippers, Carhartt will send you a new zipper for free. Is there any way to replace just the slider? The slider on my jacket seems to have succumbed to metal fatigue and keeps coming off when I pull on it, but I don’t feel like sewing in a whole new zipper to repair a hand-me-down, since I sew slowly enough that buying a new jacket at the thrift store would probably be a better use of time. I can’t find the slider itself so I don’t know which size I need.